Bow Wow!! It has been a while, and a lot has happened since my last post, we have moved house same area, but much closer to the village, which means The Owner can walk down to “His Local” whatever that is, have a couple of “Pints” whatever they are and be home within an hour of leaving the house. This therapy seems to be working, as he is only gone for an hour and arrives home in much better form than he left and most importantly he walks. I would like to go too, but The Owner says no dogs allowed only blind dogs… Anyone got a spare high visibility harness? So the house move went fine, and we are all settled in, including The Cat. No real surprises until moving in day, The Owner was complaining of a sore back, little did we know… He went to the doctor and the issue has been diagnosed as a prolapsed disc, that is pinching a nerve going down his left leg, looks and sounds very, very painful. 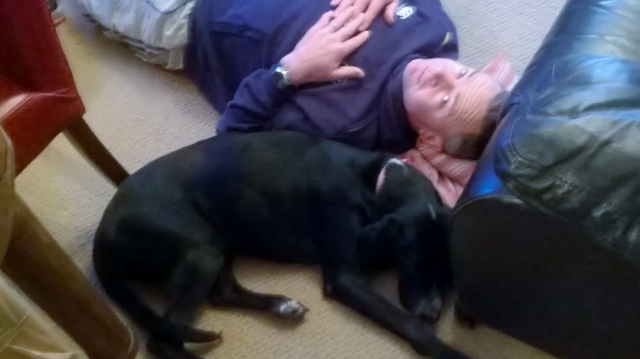 He has been referred for surgery but in the mean-time lying on the floor is the best treatment… this is where I come in. I as you are all aware am a world champion at lying around on the floor, I have won the endurance competitions in my breed for the last 3 years. You can observe my technique in the picture above. What it has meant is The Owner has not been able to sit, or drive for the last 4 weeks, so while he is flat on the floor the Mom has had to take up all the slack, as well as unpack in a new house and look after the children. Tough going in anyone’s book. There has been some upside, his posture has improved dramatically, he is walking a lot more, he looks like he has grown 2 inches and lost 25 pounds. This gave me pause for thought, how come it has taken something unrelated to Parkinson’s Disease, to get him exercising more frequently and walking everyday? I think the answer is confidence… He has realised (the hard way!!) that he has to look after his whole body and if that means walking slowly to start with so be it. Attitude and exercise works for mind as well as body. If you want to read more of my story please like, share and follow. Next > The Only Place You are a Burden… Is in Your Own Heart.